Big Brain Academy is very newbie-friendly: it's easy to use and it's designed with new (and non-) gamers in mind. Navigation through the menu is simple and, while you have to log in to play Vs, you don't have to log in to send a demo. Once you've logged in, the Versus option is right there. There's not an extremely long forced credit sequence. The download times are quick, especially considering that all fifteen (15) activities come along with the download (which takes as little as 45-50 seconds each). The only non-newbie thing in Big Brain Academy is the "Form A Group" requirement. Some players who aren't familiar with the basic setups will find themselves sitting and staring and waiting for something to happen. People unfamiliar with video games in general might not understand. Oter than that, options to tap on are large and with sufficient buffer space. Options make sense, are well located, and respond appropriately. As with any title that is a compilation of mini-games, some of the games will work better than others. Overall, however, whether you're writing, drawing, or tapping, the game responds quickly and gives you the expected response almost all of the time (and most of the rest of the time, it's because an answer was wrong or mis-tapped). While none of the games have reactions and reaction timings that are bad, some are a little too sensitive (make sure the line you draw in Pathfinder actually comes in contact with both of the verticles you're connecting). The graphics in Big Brain Academy are intentionally low key. Nintendo strives for, and achieves, a simplistic, stylized graphic scheme which ranges from overexaggerated people and animals to 3D-looking blocks to the hand-drawn, extremely creepy Professor Lobe (?!?). The sound in Big Brain Academy mostly consists of sound effects that are appropriate but, at times, almost essential (Sound Bites). Both the demo and the Vs modes include all fifteen (15) activities (randomly selected each time in the demo), so there's a lot of content (most of what's available on the game chip, not counting the whole tracking your brain weight and to a greater accuracy). Different people can have very differing views on educational "brain" games. Some people don't enjoy them and just want to play first-person shooters. So people think they're the greatest thing since before sliced bread. I, personally, have many interests and can enjoy almost any game - if it's a good game. Whether it's a brain game, a shooter, a puzzle game, a role-playing game, or anything else. I look at each game in its own perspective. In the case of Big Brain Academy: is this brain game a good brain game? My answer is a resounding yes. In fact, both of Nintendo's brain game series (the Big Brain Academy series and the Brain Age series) are excellent and have become synonymous with the genre in general. They've come to help define the genre. Unique to Big Brain Academy (between the two Nintendo series) besides the fact that you're seeking "brain weight" (instead of "brain age") is the enhanced Vs play, a greater graphical interface with a more colorful presentation, and an enhancement to how you react to what you've deduced. With fifteen (15) activities, anyone with a competitive streak and a desire to be the best (win) will find a lot of replay value. Again, some of the activities are better than others but, if you like the genre (even a little), you'll love the game. Remake the "Form A Group" screen to two options: "Host A Game" and "Join A Game" (you know, for the Newbies). Allow a couple of the activities to be played demo-vs-demo. Add connectivity to the Nintendo Wii. Introduce "Single-Card Download Via Wi-Fi" (using friend codes, of course). 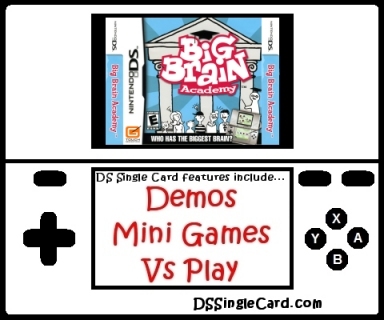 Click here to return to the DSSingleCard.com Big Brain Academy profile.